Pain is a distressing feeling often caused by intense or damaging stimuli, such as stubbing a toe, burning a finger, putting alcohol on a cut, or bumping the "funny bone". 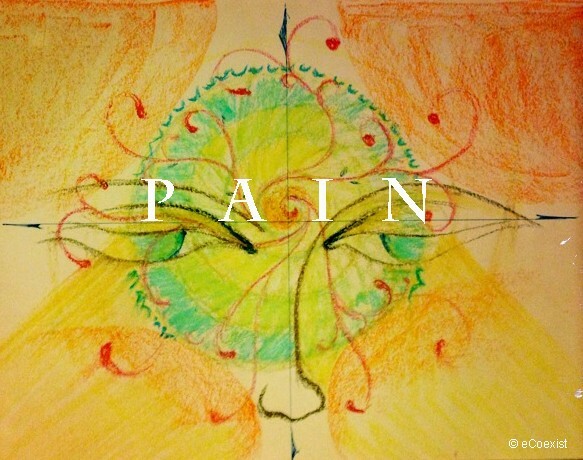 Because it is a complex, subjective phenomenon, defining pain has been a challenge. Do animals experience pain? Is pain a function of 'being conscious'? As we explore the processes involved in healing, we ask ourselves - from what is it that we want to heal? The answer is usually - 'suffering' and to be more specific - the pain we feel. The immediate pain that human beings experience is closely related to the physical state of their bodies. And yet, pain is experienced by the mind - some times even in absence of any physical stimulus. What is the role of pain in Nature? Does it have a function? Has the pain we experience today become somewhat un-natural? I grew up in a family that believed in developing tolerance to pain. As youngsters we were not given access to simple pain killers and told instead to 'bear it'. While this was not very pleasant at the time, in our later years we began to appreciate the stretching of our limits and started to be grateful for this training. I watch my animal friends when they are distressed about something and I can see clearly that animals do suffer from pain too. Yet their response to it is much more patient and accepting than ours. They intuitively do what they can to alleviate this pain - instincts of looking out for and eating herbs, resting, fasting to give the body time to heal - these are clearly observable in their process of self healing. And yet, when they cannot heal, they resign themselves to the situation. How does all this relate to the environmental situation around us? In an effort to avoid or terminate pain we sometimes become numb to it - in ourselves as well as to the pain of others. Empathy is minimized, as it is overcome by a fear of adding to the pain we already feel. The manner in which human beings have industrialised the production and harvest of other species of life for their own food is one symptom of this lack of empathy. We want to reduce our own pain but are unable to feel or bear another's pain. This disconnects us from each other and isolates people further. In the human world, I observe some people who have a very high tolerance of pain, have in fact mastered their minds. Even if their bodies suffer just like others, they rarely panic or aggravate their physical suffering with mental anxiety. They watch, take action and wait. To them pain is not necessarily a negative thing. It is a way in which the body communicates to the mind. It can become a tool to stretch the limits of the human experience. The German philosopher Friedrich Nietzsche, wrote: "Only great pain is the ultimate liberator of the spirit….I doubt that such pain makes us ‘better’; but I know that it makes us more profound”. To be able to look pain in the eye, to accept it as a natural part of life, to understand how we can alleviate our own pain - gives us the strength to empathize with and help others in pain too. The beginning has to be with our own bodies.